The Spring Break Basketball and All-Sports Camps are both great options for any young player who is willing to improve his skills, learn new moves, make new friends and have fun! 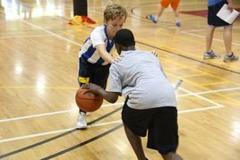 Basketball Campers will develop and elevate all of their basketball skill sets. - shooting, passing, dribbling, rebounding and defense. All-Sports campers have the opportunity to play football, dodge ball, soccer and a wide array of "circuit sports" throughout the week. 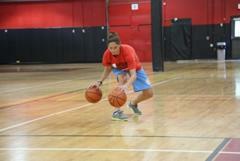 Over the course of the camp, participants self-confidence will grow along with overall appreciation of the game. *Early Drop-Off and Late Pick-Up may be arranged for an additional $10 per day. A vertical development and fun-filled option is offered for all campers in the form of 2 one-hour sessions at Raleigh-Durham's Indoor Trampoline Center, Defy Gravity (connected to Hoops City). These sessions are $12 each and will be offered on Tuesday and Friday from 12:30-1:30. Signups will be taken on a first come-first serve basis on the first day of the camp.